ST. P ETERSBURG, FL – The Florida Orchestra Musicians Association announces the winners of the annual Justine LeBaron Young Artists Competition. The overall grand prize goes to pianist Marco Jimenez, 16, of St. Petersburg, who will perform the first movement of his winning competition piece, Beethoven’s Piano Concerto No. 4, with The Florida Orchestra on a Coffee concert in March 2020. The grand prize runner-up is William Ramos, 17, of Palm Harbor, who performed the first movement of Mozart’s Concerto for Bassoon. Second runner-up is Sophia Chen, 15, of Tampa, on Saint-Saens’ Piano Concerto No. 2, first movement. The competition is named in remembrance of the former principal horn of The Florida Orchestra, Justine LeBaron. This year, 37 classical music students from Pinellas, Hillsborough and Pasco counties competed in the senior and junior divisions in piano and instrumental categories. Ages ranged from 8 to 22 years old. Cash prizes totaling about $4,600 will be distributed among the winners. The competition was held March 23 at the Music Center on the Gibbs Campus of St. Petersburg College, and it was directed by TFO Principal Tuba William Mickelsen, who is also adjunct faculty at the University of South Florida and St. Petersburg College. John Wilson, former news anchor of Fox 13 television, assisted with the awards ceremony. 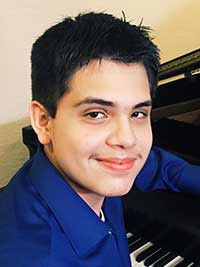 Grand Prize: Marco Jimenez, 16, piano, St. Petersburg, Beethoven’s Piano Concerto No. 4, 1st Mvt. First Runner-up: William Ramos, bassoon, 17, Palm Harbor, Mozart’s Concerto for Bassoon, 1st Mvt. Second Runner-up: Sophia Chen, piano, 15, Tampa, Saint-Saens Concerto for Piano No. 2, 1st Mvt. * Miranda won First Place in Junior category last year; therefore, she had to compete in Senior category this year. The competition winners also performed their audition pieces at the afternoon recital following the awards ceremony. The Florida Orchestra Musicians Association is passionate about making and sharing music with the community, as well as nurturing the next generation of classical musicians. Funding sponsors of the competition include Florida Orchestra board members Maria Cantonis, Peter and Susan Betzer, Jeanne Coleman, Elizabeth Sembler, Jane and Kent Fanning, James Gillespie, and Jane Strom; Florida Orchestra musician (retired) and husband of the late Justine LeBaron, William Don Owen; the TFO North Suncoast Associates, and North Suncoast Associates members Martin and Marilou van Zanten. Piano division judges were Susan Robinson, St. Petersburg College piano faculty, and Duncan MacMillan and Dale Williams, both University of Tampa piano faculty. Instrumental division judges (all Florida Orchestra musicians) were Don Owen, Principal Trumpet (retired); Ben Markwell, Assistant Principal Viola; Joel Vaisse, Principal Trombone; Kathie Aagaard, Assistant Principal Viola (retired), Roger Funk, Double Bass; Kristin Baird, Violin/Teaching Artist; and Kaitlin Springer, Viola/Teaching Artist.